The littlest things make her happy, which makes me happy. She is just growing like a weed. I can't believe it. We played outside yesterday with bubbles and then chalk. I don't know who had more fun yesterday...Conrad blowing the bubbles, Aubrey chasing the bubbles or me snapping away with my camera!! 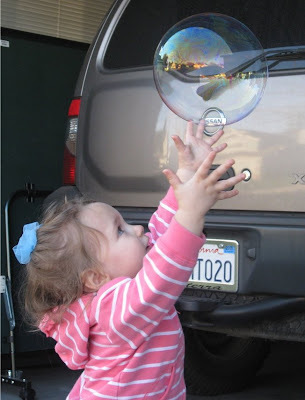 She learned how to say BIG BUBBLE. Then all the bubbles were BIG BUBBLES! The chalk was a lot of fun. She wanted to draw everywhere. On the sidewalk...the house. She didn't like her hands being dirty. She was my little artist. I can't wait for it to start getting warmer and we can spend more time outside.